Deciding not to follow the decadent doughnut trend the likes of Doughnut Time have introduced, the new DK Magic store is focused on selling good old cinnamon classics. Cinnamon doughnuts sold at DK Magic stores will however have their own twist, with different sugar flavours such as banana, salted caramel and wild berry available. Donut King’s General Manager, Nicholas Brill, says DK Magic stores will also sell hot drinks, milkshakes and bottled drinks. “The decision to focus on cinnamon doughnuts was driven by the fact it is Donut King’s best selling product,” Brill said. Donut King’s first DK Magic store is now open and located in Toowoomba, Queensland. 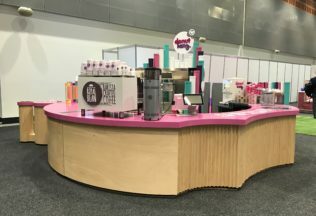 Donut King is part of the Retail Food Group (RFG), which also owns Crust Pizza, Gloria Jeans, Michelle’s Patisserie, and a number of other quick service food restaurants located across Australia.